My art unless I Say it ain't! 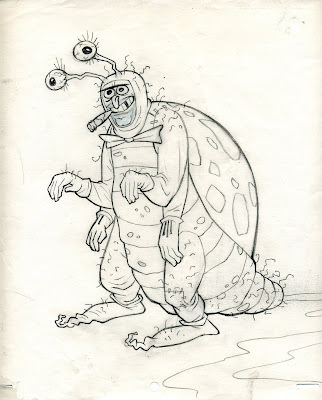 Another groovy guy that Jim Gomez and I came up with. 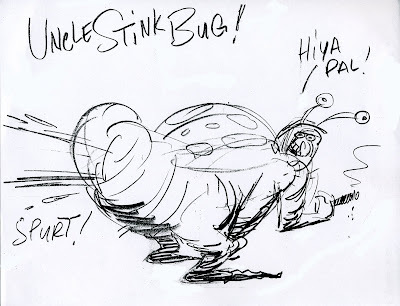 He's everybody's obnoxious uncle that just so happens to be a six foot Stink bug who greets you by turning around and hitting you full in the chest with a fire hose blast of bug stink! Great, amazing and so thrilling job Bob, I really like it ! You're great, mister Camp. And earned a links status on my blog... Ahahah. p.s. : sorry for my accent, sir, I'm french... oops. This is too much, thanks for sharing this Bob ! tell jim gomez to start a blog. I would not like to meet that uncle. It would be better if he was a "distant" relative... very distant. By the way, great work. More great characters, a series with this guy and Gnarly Headrush would probably make my eyes explode. In a good way of course. I didn't think there were many more ways for uncles to be obnoxious, but here we are. Thanks for adding me to your links! Your English is much better than my French! Yeah he is the worst of everybody's bad uncles. They were created for 2 different show concepts. Your drawings make my eyes explode! I yam what I yam and I eats me spinach!